The first book to explore the idea and effect of moral injury on veterans, their families, and their communities. Although veterans make up only 7 percent of the U.S. population, they account for an alarming 20 percent of all suicides. And though treatment of post-traumatic stress disorder has undoubtedly alleviated suffering and allowed many service members returning from combat to transition to civilian life, the suicide rate for veterans under thirty has been increasing. Research by Veterans Administration health professionals and veterans’ own experiences now suggest an ancient but unaddressed wound of war may be a factor: moral injury. This deep-seated sense of transgression includes feelings of shame, grief, meaninglessness, and remorse from having violated core moral beliefs. Rita Nakashima Brock and Gabriella Lettini, who both grew up in families deeply affected by war, have been working closely with vets on what moral injury looks like, how vets cope with it, and what can be done to heal the damage inflicted on soldiers’ consciences. In Soul Repair, the authors tell the stories of four veterans of wars from Vietnam to our current conflicts in Iraq and Afghanistan—Camillo “Mac” Bica, Herman Keizer Jr., Pamela Lightsey, and Camilo Mejía—who reveal their experiences of moral injury from war and how they have learned to live with it. Brock and Lettini also explore its effect on families and communities, and the community processes that have gradually helped soldiers with their moral injuries. 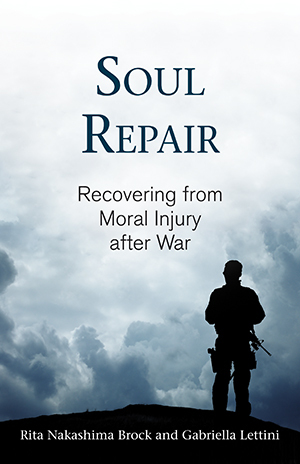 Soul Repair will help veterans, their families, members of their communities, and clergy understand the impact of war on the consciences of healthy people, support the recovery of moral conscience in society, and restore veterans to civilian life. When a society sends people off to war, it must accept responsibility for returning them home to peace. To violate your conscience is to commit moral suicide. Rev. German Keizer Jr., Colonel and Chaplain, U.S. Army, Ret. The group’s distress was raw and urgent. Their description was dis- jointed, as if their jumbled memories had not come into focus. When they realized that Rita was puzzled, they filled in some of the details. They explained that the suicide of a young veteran, deeply beloved in their church, was unexpected. The whole church community was reeling and struggling to understand how it had failed him. He was a hero to so many, they said, that the Department of Veterans Affairs (VA) had sent crisis counselors to a national gathering of veterans meeting at the time of the suicide. After the group explained the impact of the suicide on them and their community, one of the women said, “We want to learn more about moral injury. Our community needs this information. We couldn’t save Clay, but maybe we can help save others.” Within days of Rita’s lecture in April 2011, national media sources reported Clay Warren Hunt’s story. He was a twenty-eight-year-old former marine corporal who earned a Purple Heart serving in Iraq and Afghanistan. He had been active in a suicide-prevention program for vets. Since 2009, he had been a model to other veterans of a successful return home. He married and started college in California; he advo- cated for veterans’ rights and worked in disaster relief. He was being treated for post-traumatic stress disorder (PTSD). Then, his marriage ended, he left school, went into treatment for depression, and returned to Houston where he got a job and an apartment in Sugar Land, Texas. On March 31, 2011, he bolted himself in that apartment and shot himself. Over a thousand people attended his funeral. Veteran suicides average one every eighty minutes, an unprecedented eighteen a day or six thousand a year. They are 20 percent of all U.S. suicides, though veterans of all wars are only about 7 percent of the U.S. population. Between 2005 and 2007, the national suicide rate among veterans under age thirty rose 26 percent. In Texas--home of the largest military base in the world and the third-highest veteran population--rates rose 40 percent between 2006 and 2009. These rates continue, despite required mental health screenings of those leaving the military, more research on PTSD, and better methods for treating it. Veterans are also disproportionately homeless, unemployed, poor, divorced, and imprisoned. The statistics, however, do not disclose the devastating impact of war on veterans’ families and friends, on their communities, and on other veterans. The journey home to peace is perilous after war. We can make it less lonely and lethal. The veterans’ stories that unfold in this book describe a wound of war called “moral injury,” the violation of core moral beliefs. The stories reveal the lifelong struggle of veterans to live with its scars, the impact on their families, and the various ways our society can support the recovery of those who experience moral injury. Moral injury is not PTSD. Many books on veteran healing confuse and conflate them into one thing. It is possible, though, to have moral injury without PTSD. The difference between them is partly physi- cal. PTSD occurs in response to prolonged, extreme trauma and is a fear-victim reaction to danger. It produces hormones that affect the brain’s amygdala and hippocampus, which control responses to fear, as well as regulate emotions and connect fear to memory. A sufferer often has difficulty forming a coherent memory of a traumatic event or may even be unable to recall it. Symptoms include flashbacks, nightmares, hypervigilance, and dissociation. Our ability to calm or extinguish fear and process emotions is often impaired by trauma, and a previous history of emotional trauma or a brain injury can make a person more susceptible to PTSD. Dissociative episodes can put sufferers back into experiences of terror and make them lose a sense of the present. They can feel unreasonable fear in ordinary situations or startle at sounds that mimic battle. They may experience a compulsive need to retell stories of terror, to reenact them, and to transfer past fear-inducing conditions to the present. With PTSD, memory erupts uncontrollably and retraumatizes the sufferer, which can make retrieving a coherent memory nearly impos- sible. Clinicians have treatments for PTSD, and such therapies are crucial for those diagnosed with it. The moral questions emerge after the traumatizing symptoms of PTSD are relieved enough for a person to construct a coherent mem- ory of his or her experience. We organize emotionally intense memo- ries into a story in the brain’s prefrontal cortex, where self-control, planning, reasoning, and decision making occur. The mind creates a pattern from memory fragments stored in various places. Emotions are essential to moral conscience, but until people can construct enough of a coherent narrative to grasp what they did, they cannot evalu- ate it. The brain organizes experiences and evaluates them, based on people’s capacity to think about moral values and feel empathy at the same time. Marine veteran and philosopher Camillo “Mac” Bica used the term moral injury in his war journals from Vietnam, and, from the per- spective both of warrior and of moral philosopher, he has explored the agony of this inner judgment against himself. Moral injury is the result of reflection on memories of war or other extreme traumatic condi- tions. It comes from having transgressed one’s basic moral identity and violated core moral beliefs. Moral injury names a deep and old dilemma of war. The moral an- guish of warriors defines much literature about war from ancient times to the present, such as the Greek Iliad and Indian Bhagavad-Gita, both war epics; the Hebrew Psalms; and modern novels and films, such as Catch-22, The Deer Hunter, or Matterhorn. We see discussions of moral injury in current memoirs of the wars in Afghanistan and Iraq. In Packing Inferno: The Unmaking of a Marine, Tyler E. Boudreau, a veteran of Iraq and former Marine officer, reflects on the apparent inability of societies to learn from works of art and history about the torture that war inflicts on the souls of veterans. He concludes that societies have understood war only as much as they really wanted to learn about it and its deeper meaning. She was just a writer. That tells me, if nothing else, that the in- formation was there. The capacity to know existed. It wasn’t beyond human understanding. They weren’t too primitive. If Virginia Woolf knew about combat stress, everybody else could have known, too. They did not know because they didn’t want to know. Still, not even Tyler could face telling the truth about war. After he left the Corps, he worked as a Casualty Assistance Calls Officer (CACO), which required him to call the parents of wounded Marines. He could not bring himself to call soldiers’ families and report hon- estly that, among the wounds they suffered, “your boy is coming home with a broken heart.” Never once was he able to say it, and he regrets it still that he did not. Moral injury results when soldiers violate their core moral beliefs, and in evaluating their behavior negatively, they feel they no longer live in a reliable, meaningful world and can no longer be regarded as decent human beings. They may feel this even if what they did was warranted and unavoidable. Killing, torturing prisoners, abusing dead bodies, or failing to prevent such acts can elicit moral injury. Handling human remains can be especially difficult; for example, in 2004, Jess Goodell served in the Marine Corps’ first Mortuary Affairs unit in Iraq, which required her to recover and process remains of fallen sol- diers, including drawing their outlines where they had fallen, filling in missing parts in black. In her memoir, Shade It Black: Death and After in Iraq, she describes the devastating aftermath of this work of facing death every day. Seeing someone else violate core moral values or feeling betrayed by persons in authority can also lead to a loss of meaning and faith. It can even emerge from witnessing a friend get killed and feeling survivor guilt. In experiencing a moral conflict, sol- diers may judge themselves as worthless; they may decide no one can be trusted and isolate themselves from others; and they may abandon the values and beliefs that gave their lives meaning and guided their moral choices. Recently, Veterans Affairs clinicians have begun to conceptualize moral injury as separate from PTSD and as a hidden wound of war.